It is March now! The time has gone by so fast. I only have 3 months left until my a-level exams, and I am stressing out big time! 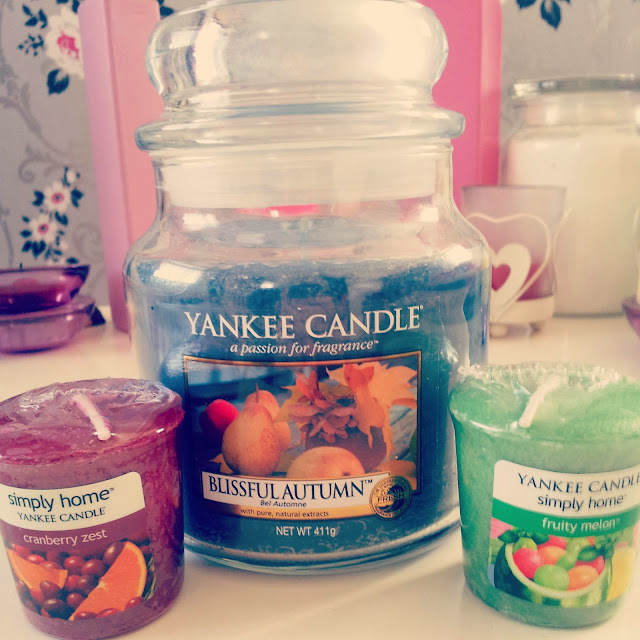 What calms me down the most, are Yankee candles. The fragrance is so strong and they last forever. I have recently bought those three candles, one jar and two votives. The fruity melon is a must-have this Spring!! What I really wanted to talk about today was the outfits I wore last Thursday. Below is a picture of me wearing white jeans and a teal camisole. I wore that outfit to college that day. The jeans I am wearing were on sale in H&M for whooping £5!!! The camisole is from Primark, the gold chain is also from Primark. My nails are by Barry M in the colour Peach Melba. Excuse my dirty mirror, I didn't realise that I had so many finger prints on it. It must have been my brother messing about with my sister and poking at things with their sticky fingers!! Later on that Thursday, I was going out with my 3 close friends to a restaurant called Chutney. One of my best friend's father own the place and they were having a Bollywood night. Me, being a great lover of Indian cuisine, was the first to get ready for this event! I have used all of my sparkly eye shadows and Indian bangles I have received for my 18th birthday. They were really hard to put on as they are meant to be tight around the wrist, so I had to moisten up my hand to get them on!! I wore my emerald and black lacy bodycon dress and black suede wedges. That is it for today guys, I will try and post more but I really have no free time to do so as revision awaits me :( coursework deadlines also do not help! !